Over the past several months, we have watched ICTs play important roles in social movements and revolutions throughout the Middle East. In countries from Tunisia and Egypt to Bahrain and Yemen, public protests have been organized on and through social media sites while recorded footage of demonstrations and conflict with police are uploaded on the Internet and available for viewing around the world. 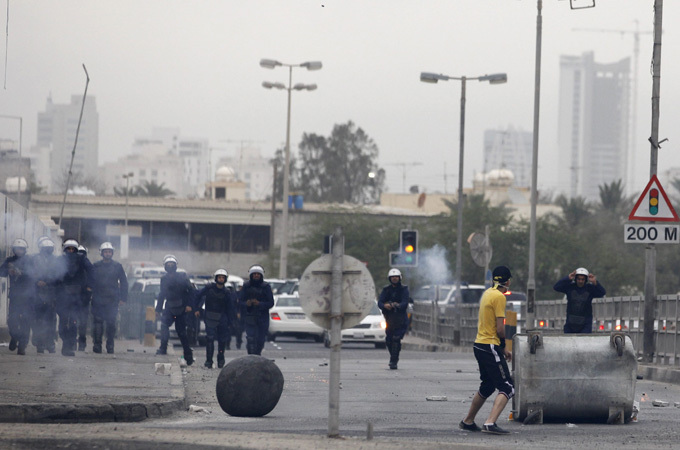 Bahrain, has been experiencing civil unrest for more than a year now, with a recent increase in protests and violent incidences in correlation with both the one year anniversary of unrest, and the upcoming planned Formula One race. We often hear positive reactions to these uprisings, referred to as The Arab Spring. While each context differs in scope, government reaction, and the people’s demands, the region is cited broadly as going through a period of civic action and disruption, and it is hoped this will lead to some ‘better’ form of democratization. The media, increasingly through use of the Internet and other virtual platforms has become a place where the public finds information, and arguably can participate in informal education. Therefore the connection between notions of democracy, education and ICTs are strong, centrally shaping the ways in which we learn in a globalized world. Michtell Belfer’ s editorial in the Gulf Daily News, warns against the way in which Internet and the media have often distorted uprisings and protests, feeding into false and growing stereotypes about what civil unrest in the Middle East looks like. Mitchell Belfer’s piece raises many interesting issues worth focusing on. He starts by criticizing the way in the media frames public demonstrations in Bahrain, and more broadly in the Middle East, claiming that protests are portrayed as chaotic, “rudderless, leaderless sums of their parts”. He argues that depiction of orderless movements of pure passion or anger, disregard the many roles and motivations of leading activists and the coordination inherent in these communal actions. Within both leaders and followers, lie different goals, tactics and levels of participation. But he also discusses what is needed to build a strong democracy: a strong civil society, informed and relatively secure. He worries that the unending civil unrest, despite mostly progressive intentions, can potentially stifle a democratic atmosphere. If civil society does not feel safe, there will be a limit to their public participation and information sharing. He sees a lack of individual accountability for the destructive actions by protesters or police as a central problem to building a more secure environment. There has to be a shift in identifying damaging actions as crime, and not justifying them as a necessary part of protest or revolution. (Belfer 3/29/2012). So my question is this— can ICTs play a better role in being a platform for educational information, transparency and multiplicity of opinion? Who, if anyone should regulate this? Can the media use ICTs for more than the spread of free information, but for providing a critical education, dialogue and serious consideration for the challenges that these forms of representation bring? This of course, is not only about enhancing the content and information that is shared in media and on the Internet. There are serious issues of censorship by the government. Censorship comes in many forms, from the government blocking websites that are threatening to them, to the disappearance, detentions and murders of journalists in Bahrain who have been outspoken in recent months. Educational media shared through ICTs is very much limited by the people who create it, disperse it, and those who try to control or shut it down. While ICTs have played an important role in the protests in Bahrain and the Middle East, we always have to ask ourselves, even with the powerfully raw video footage or audio recordings, what is not being said and why? Are all protestors motivated by the same thing? Which perspectives have received the most attention? What has the government covered up? What have they allowed? What have they been too slow to catch before it goes viral? While we may or may not hear about developments in the Middle East in formal spaces of education, there is no question that ICTs have created a new age of information sharing and learning. In my view this information is at its core an educational moment or exchange—within or outside of the classroom. I am in awe of how the Internet has created such instantaneous access to content and action, across the globe. Though potentially tainted or censored, these tools have certainly done more than expose, they have helped communities organize, amplify their voices, and learn from the experiences of others. In thinking more broadly about “globalization”, it is obvious that ICTs, especially the Internet is one of the major forces to push the phenomenon forward. Yes, we can see the flood of online initiatives such as Facebook, Twitter, blogs and personal TV or air stations, expressing and spreading their own thoughts and ideas to far corners of the globe. Under the name of the globalization, what can really cross the border and what cannot? When the authoritative powers such as government and global firms try to take control over internet-based activities, it is surely very powerful. 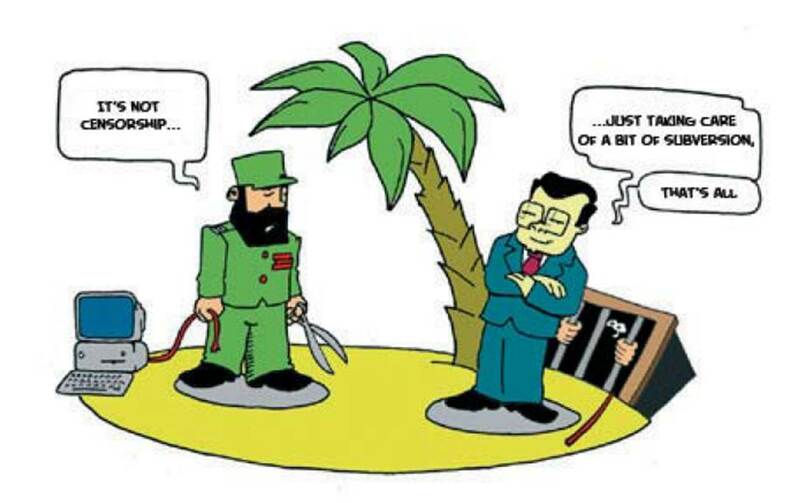 Posts by Maria and Fatima thoughtfully raise this point, referring the cases of Cuba and China. In this post, I would like to turn our gaze to other perspectives: civic engagement and censorship— seen in initiatives by the people. The article by Aljazeera “Pakistani political satire becomes internet sensation” reports that Pakistani youth released the song titled “Aalu Anday”(translation: Pakistani home cooking with eggs and potatoes when the meat is not available) the lyrics of which include a lot of political satire, something that has rarely been experienced in Pakistan these days. The singers of the song called themselves the ‘Beyghairat (dishonor) Brigade’; it is a pun for the existing “ghairat brigade” or moral police that has a certain power over the Pakistani society . Beyghairat Brigade uploaded their music video “Aalu Andy” on Youtube.com with tens of thousands of hits, and their video has prevailed through Pakistan with blogs, tweets, and Facebook “likes”. ‘Mullah + Military = Ziaul Yuckee’ (the alliance between religious parties and the military that began strengthening during the dictatorship of Ziaul Haq). Satire has been one of the handful of means that marginalized people use to resist state power. Lampoons, cartoons and theater plays, which are full of crafted ways to slip through the restrictions imposed on speech, have consoled people’s feelings and uplifted their spirits. Arshad Mahmud, who joined in political satire activities in Pakistan during 1970s-1980s when official censorship was much more intense than it is today, reflects back his work as: “We would pore for hours over each line of the script to make sure we put across a point without being hit by the rules, or use words that could be interpreted in other ways than we intended them to“. Considering the wider prevalence of the Internet across the globe, online activities such as satirical music video posts by Beyghairat Brigade’s, teets and Facebook have higher diffusing capacity than the old paper medias does. In this regard, online activities are a convenient vehicle for satire. However, means of enforcing online censorship such as filtering techniques by private companies have also progressed. Therefore, people who want to express something must be prepared to face difficulties. Salma el Daly, Egyptian video blogger, describing the freedom of speech via Internet, “You can say whatever you want, but you will pay for it.” This is also true for a member of Beyghairat Brigade, they are clearly reflecting that reality. In the very last part of the video, one of the members holds the placard, saying “If you want a bullet through my head: like the video”. Moreover, while the reporter of Aljazeera concludes his comment by saying “One thing is certain: Many people in Pakistan is listening”, Huma Yusuf of Dawn.com views the popularity of Beyghairat Brigade in a different way. It reports that Beyghairat Brigade’s song has been limited to an “internet” sensation, where the Pakistani Electric Media Regulatory Authority views little impact on most of the ordinarily Pakistani people, therefore, even as the band’s song are viral this does not mean their victory but their defeat as they are seen as “non-threatening”. Anyhow, I personally commend Al Jazeera for reporting on the band, because at this moment, no one can foresee the effect that Beyghairat Brigade might have on Pakistani society and its future generations. Instead of discussing its immediate effect, I would like to pay attention to what the rebellion of Beyghairat Brigade shows us—relentless fighting from people despite persistent censorship in most spaces. Certainly, online censorship or filtering techniques are a tremendously strong power which regulate freedom of speech. However, as the history shows, people’s strong will, wisdom and courage mean innovative ways to re-kindle their voices and utilize new tools such as YouTube, Facebook and blogs. It’s hard to start a blog about a topic that I find so delicate to talk about, because it directly affects about 12 million Cubans. This blog aims to discuss internet censorship in Cuba and its effects on education. Cuba is a country with one of the highest levels of educational attainment in the world. Education is provided nationally, for free by the socialist government. Conversely, students and the rest of the Cuban citizens have been constantly and increasingly censored in their internet access. So, whether you’re a college student, a teenager, a young or old person, whether you live in the U.S. or in Australia, consider the possible impacts of limited access to information (e.g., in politics, news, or entertainment). Would you be a different student? Would you think the same as you do know about government agencies, historical characters, or current events? I invite you to read my blog reflect as I elaborate on this and other related topics. Cuba is a beautiful Caribbean country of about 12 million people. Under a dictatorship of nearly five decades, Cuba remains as a socialist state. All the services and products, including education, are supplied by the government. And although highly criticized by the international arena, Cuba has a literacy rate of 99.8% (for population aged 15-24 years. Source: MDGs indicators). Yet, Cuban students and the general population are unhappy with the extensive internet censorship that the government has been applying since internet was introduced in the country. So may seem like an everyday normal thing to us in the US, like sending emails, googling, or even tweetting, is a privileged activity for ordinary Cuban citizens. Control is not limited to internet usage, but also the access, purchase or leasing of computers. This is manifested in the staggeringly low ratio: only 3.3 per 100 people own a computer, one of the lowest levels in the world. Although the government is more lenient in providing access to information for educational purposes -allowing the use of certain computers and programs- others view this “special” availability as a tool to maintain social control over the available knowledge. Under this scheme, Cuba has become one of the most backward countries in internet usage with less than 2 percent of its population online. This web protectionism is based on the governmental excuse to ensure that the internet will not be used in a revolutionary way. For this reason, the authorities have a system of control and surveillance, which to the present day remains an enigma to the Cubans and to the rest of the world, because nobody knows exactly how this monitoring is carried out. This uncertainty and state control promotes nothing but a massive state of alert and fear for the Cuban cyber users. Yet, this hegemonic control of the internet in Cuba is double-sided. First, tourists in Cuba have a greater opportunity to use internet, being able to use the “international” less-censored sites available in their hotels. And second, because among Cubans there is a social class that has privileged internet access from their homes; they enjoy less control and surveillance, because they are thought not to represent any political risk. This particular division in the internet usage along with a centralized management of power has led to a repeated censorship, intimidating and stigmatizing people who think differently in Cuba. Snapshot of the Cuban version of Wikipedia: EcuRed. Yoani Sanchez, is a 35-year-old mother, a wife, a philologist, a writer, a blogger, and considered as many, a leader in terms of internet censorship in Cuba. She has asked for hackers worldwide to help 12 million Cubans that are in need of the free usage of internet (Watch interview in Spanish). Ms. Sanchez tries to describe how her generation remains in the dark; so close, yet so far from the light of information and knowledge freedom. What the government calls “cyber-garbage” a group of students, journalists, and ordinary people fight for the same purpose. Remarkably, this resistance has won important small victories: Ms. Sanchez has been recognized by the former President Jimmy Carter, President Obama, and in 2008 by the Time magazine who included her in the list of 100 most influential people in the world. However, along these small victories, the government counters attacks with a constant censoring of online content containing what they interpret as subversive and revolutionary words. This constant surveillance, in Ms. Sanchez’s words, leads to the Cubans feeling “… as if we’re abandoned and motionless by the side of the expressway, with ever faster and speeding kilobytes unattainable to us”. While the government maintains the position that internet usage is limited to academics, students and government workers, I ask, is it really that helping to educational purposes? I tend to think that they might be biased to restrict knowledge and what is taught. Especially if the students do not have access –as almost the rest of the world does- to one source that can be really helpful. Such questions lead me to think that in reality, the government does limits the type of knowledge available to educational motives, because the internet can be perceived as a threat to destroy the system. This protectionism is reflected in “in vitro versions of Facebook or Wikipedia style sites to schools and workplaces”; to achieve this, the government spends thousands of dollars to create controlled programs and interfaces for local use. After an extensive search in the web, in both local and alternative sources, I can say that few media outlets are covering this topic: internet censorship and education in Cuba. After writing this blog I think that the question remains current, because although Cuba has an almost ideal literacy rates, there isn’t a test that asks the students about current issues, different perspectives or alternative thinking, which can really nurturing to the process of building critical skills. The truth is hardly ever matter of one and only one thing, and is often misinterpreted from analyzing when only perspective is considered. Then, do Cuban students (and the Cuban general population) have the right to know the other side of the coin? I think they do! “It’s not my job to really understand what they’re going to use it for.”- an HP executive. I knew about the Internet censorship in China but did not quite know the breadth and depth of the issue until my Chinese friends at Penn told me that Facebook, You tube, Twitter are banned in China. I dedicate this week’s entry on the Internet censorship in China and the role of Western corporations to my Chinese friends. The article by Jillian C. York in Aljazeera points out that China’s extreme Internet censorship repressing its citizens and small political groups is possible because of the creation of the “Great Firewall in China.” The surveillance tools that have gone into making the Great Firewall have actually been built by American tech corporations. Though multi-stakeholder schemes such as Global Network Initiative and Global Business Initiative for Human Rights uphold the established codes of behavior for the corporations like Google, Microsoft, Yahoo!, HP and others they do not stop Microsoft Bing and Google search engine from censoring the Internet search results, and HP from being the biggest surveillance tool provider in China. Furthermore, the 2011 revised version of the Global Online Freedom Act (GOFA)– originally formulated in 2006 to uphold the rights of net users – did not name China, Cuba and Tunisia as “internet restricting countries”. The fear is they will also avoid commenting on the likes of Saudi Arabia and Qatar, US allies that heavily control the Internet accessibility. Citing analyst Rebecca MacKinnon, the article says the GOFA bill was an “instrument” that “divides the world into ‘good’ countries versus ‘bad’ countries” and suitably legislates corporate activities as an extension of US government foreign policy. Google’s relationship with Beijing: A case of North-South Co-operation? Internet censorship in China is not new but the censorship machine became “ever more efficiently in mid 2008”. However, though individual corporations have had abrasive relationships with the Chinese government in the past, they have generally complied with their strict domestic-censorship policies even if they were in contradiction to what it espoused in the West. In this context, Jillian C. York’s accusation that Western tech corporations, such as Google, were not following the universal codes for corporate operations regarding censorship seems logical. However, the Western mainstream media continues to portray Internet censorship as the consequences of the result of the Chinese government’s policies. By doing so they discount the international corporation’s complicity and aiding of it. Therefore co-operations by the US firms in maintaining the Great Firewall definitely would function as a part of maintaining the security of the North as much as it is about profit. The case of Google’s relationship with Beijing, if looked at as a case of North-South co-operation, certainly does raise interesting questions about profit and state policies in both zones. The World Bank has given China a lower ranking in the business world for its restrictive policy. But undeterred the Chinese government has continued to pay millions to Microsoft, HP, Yahoo, Google and many more Western companies to sustain it. Considering the costs they are paying one might actually wonder if the moral education of youth in such draconian fashions is really worth it! The Chinese teachers at times bypass the censorship system to give their students access to useful content. They often do so by using proxy servers or Virtual Private Networks (VPNs) like most others. However, they are also not exempted from punishment for breaking the censorship rules, and there were instances when Chinese educators had to go to jail. An online support group for Chinese educators report that censorship is a choice in China, and not totally obligatory. The reason is that most of the websites published in English by other countries are accessible from China, so anyone with some knowledge of English can read the content of those websites. Teachers can do so too, however, the risks of being punished for not abiding by the censorship rule and going to jail remain! Clearly, the teachers who disobey the censorship law has reasons to do so. The avenues free Internet usage open up for education and capacity building are too numerous for any government to deny. Therefore I think at this point China must ask whether or not the youth are really benefitting from the censorship arrangement or are the Western Corporations benefitting at the cost of the Chinese people? Please share your ideas and thoughts on this matter. P.S: For more on censorship please refer to Maria’s post on Cuba’s Internet censorship, and a generation that has never spoken! Tags: Aljazeera, Censorship, China, Cuba, Gmail, Google, Great Firewall, HP, internet, Netizens, Technology, The World Bank, Tunisia, Yahoo!